Habitat: Desert (upper), Upland, Mountain. 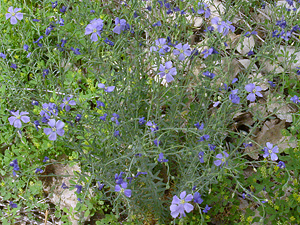 This attractive wildflower mainly grows in upland areas, but it can also be found in higher elevation desert areas. Description: The flowers are up to 2 inches (5 cm) across and homostylous (styles of all the same length) and have 5 broad, fan-shaped petals, styles longer than the stamens, 5 arrowhead-shaped anthers, and 5 spherical stigmas. The leaves are single-veined and linear to lanceolate in shape. 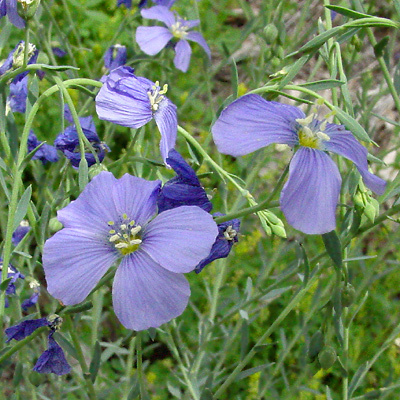 The similar Meadow Flax (Linum pratense) grows at lower elevations and has narrower, very pale blue petals and shorter styles. Edible – The seeds are edible, but only if cooked. The raw, uncooked seeds are poisonous. The cooked seeds have a nutty flavor and a high oil content. Poisonous – Although the plants and raw, uncooked seeds contain a cyanogenetic substance (a substance capable of making cyanide) and are somewhat poisonous, animals will feed on the foliage and seeds, but they do avoid the fruit.